Note: this is an archived entry. Some links might not still work, but I have tried to ensure scan and video embeds are still in place. If any linked material is unavailable, please let me know and I’ll attempt to find a copy in my personal archives. There hasn't been any earthshattering breaking news since the first of the year (or the last update), but many new articles and reviews of Hugo's films Cloud Atlas (which has still not debuted in Australia and the UK, where it's due next month) and The Hobbit: An Unexpected Journey continue to appear. I'll also share links to a bunch of new scans I uploaded to Flickr about these films and a few others, and some video embeds that are either newly available in higher-res formats, or are newly available on YouTube. Hugo began filming his role in the compendium project The Turning in early December. This was probably the reason he opted out of most of the post-Wellington Hobbit premieres, though I wouldn't say it pained him to skip a few more red carpets. 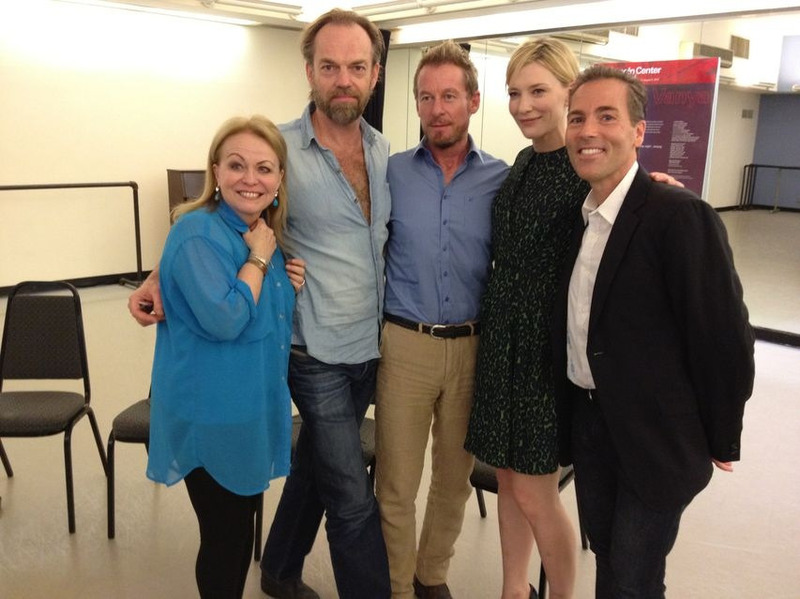 Hugo referenced the film in an 3AW Radio interview conducted at the Wellington premiere (and shared in the previous Hugonuts entry), and The Turning's Twitter feed confirmed that filming on Hugo's segment (entitled "The Commission", directed by none other than David Wenham) commenced on December 10. Given the brisk pace of filming on most independent films, and the fact that this is in effect a short film that will appear in a themed compilation rather than an individual feature-length project, it's entirely possible Hugo's work on this project has been completed. 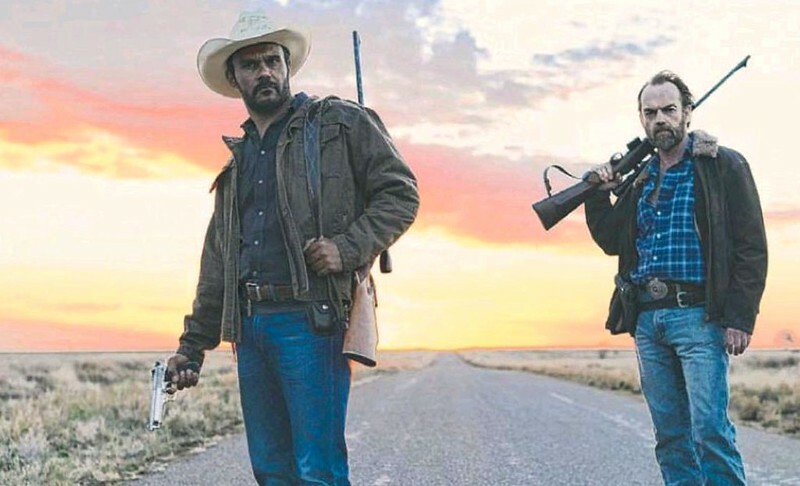 The Turning will premiere at the Melbourne International Film Festival this coming July, and some international distribution rights are already lined up, though no formal release dates have been announced. 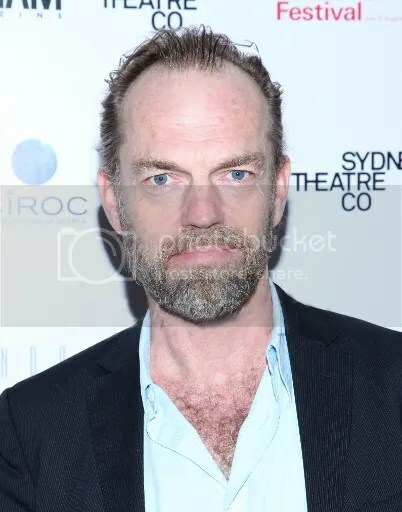 Hugo was also spotted in attendance at the premiere of Sydney Theatre Company's well-regarded new production of The Secret River, according to The Australian (and many Twitter fans). Alas, he eluded photographers– not that he should really be expected to pose for paparazzi when he's simply an audience member. 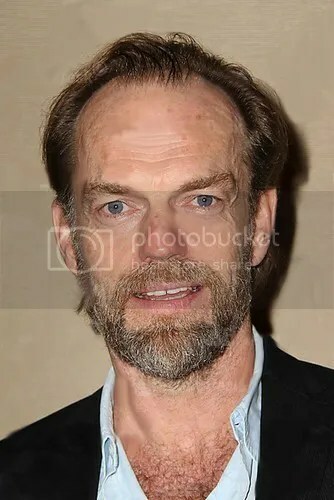 😉 Hugo's former costars Anita Hegh (Last Ride), Jeremy Sims (Riflemind) and Bruce Spence (The Matrix Revolutions, Wendy Cracked A Walnut) are in the cast, and the production was directed by his old friend/former stage director Neil Armfield. The scandalously missing/misplaced #2 is as follows: 2. PARTY ON, BILBO:"Maybe they should have it as a national day every year," Weaving said at the premiere – well, with two more Hobbit movies to come this year and next, they probably will! "It feels like a country celebrating its own culture. The film presents New Zealand culture so beautifully, that's why people here love it so much." Of more interest is a longer interview featured in the Mexican newspaper El Universal (and its online edition.) 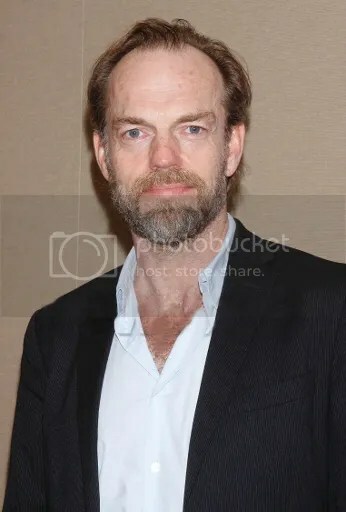 Hugo's promoting Cloud Atlas in this one, but it never mentions if it was conducted recently or back in the fall when Hugo was involved in press junkets for the film in Toronto, Los Angeles, Moscow and Berlin. 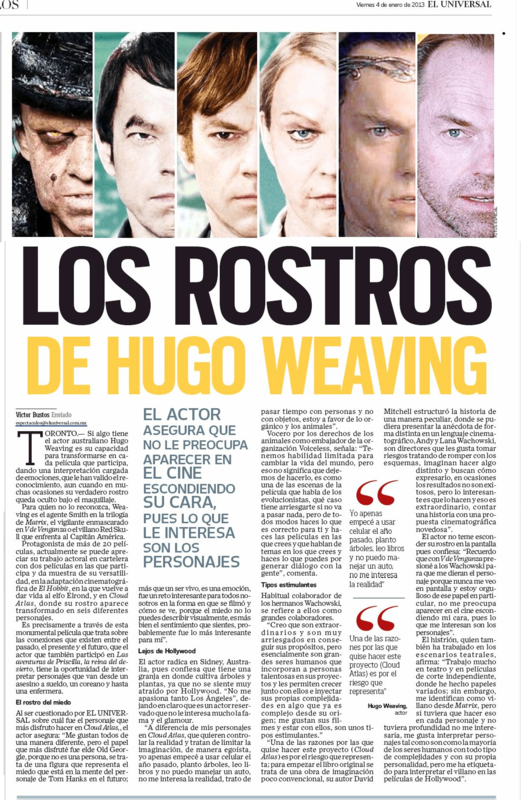 I'll include the original print version below, along with an approximate translation of Hugo's comments; you'll notice a certain consistency in his remarks on this film and his career goals, but he finds an interesting way to put things each time. 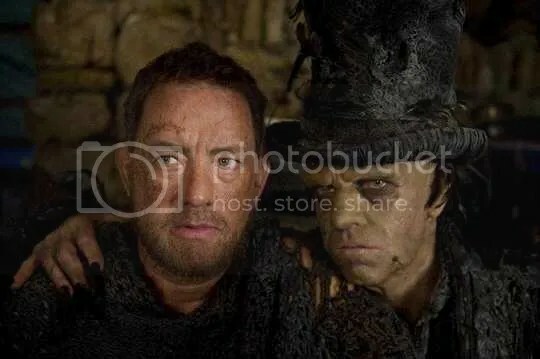 On his favorite Cloud Atlas role: ""I like them all for different reasons, but the part I enjoyed most was Old Georgie, he isn't really a living person, but a figure representing the fear in the mind of the character of Tom Hanks plays in the [postapocalyptic Zachry storyline]. 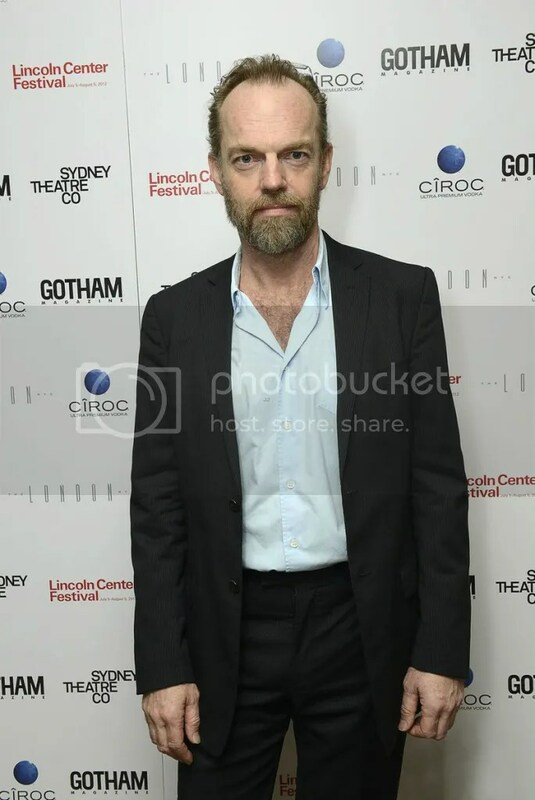 That was a thrill, an interesting challenge for everyone involved in the way it was filmed and because fear is not typically described visually, it is, rather, something you feel, [so] probably was the most interesting to me. " 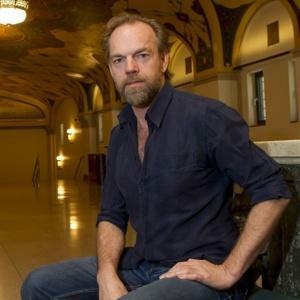 On his preferred environment and causes: "I'm not very passionate about Los Angeles…Unlike my characters in Cloud Atlas, who want to control reality and try to limit the imagination, selfishly, I just started using a cellphone last year; I plant trees, read books and I can not drive a car. I'm interested in reality. I try to spend time with people and not objects, I am in favor of the organic and animals…We have a limited ability to change the life of the world, but that does not mean you should stop trying to do it, [It's like] one of the scenes in the movie that speaks of the evolutionists, about [how much we should be willing to personally risk to effect incremental change], but at any rate you do what is correct for you and do the movies you believe in and that speak of themes you believe in and do what you can through generating dialogue with people"
On working with the Wachowskis, and his career goals: ""I think they are extraordinary and take risks in achieving their purposes, but they are great human beings, essentially involving talented people in their projects and allowing them to grow with them and inject their own complexities in something that is already complex from inception; I like their movies and be with them, they're inspiring… One of the reasons I wanted to do this project (Cloud Atlas) is the risk posed, to start with, the original book is a bold work of imagination; author David Mitchell structured the story in a peculiar way [The] story had to be presented differently in a cinematic language, and Andy and Lana Wachowski are directors who like to take risks, trying to break the rules. They imagine doing something differently and seek [new means of] expression. Sometimes the results are not successful, but the interesting thing is that they [aren't hindered] and find an extraordinary way to tell a story with each new film proposal …I remember with V for Vendetta I encouraged the Wachowski to give me the character because my face is never on screen and I'm proud of that particular character. 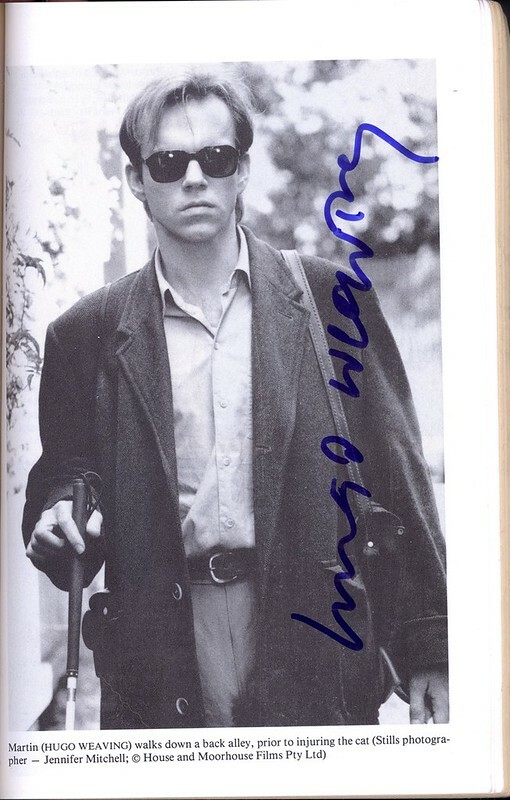 I do not care if I appear in a film hiding my face, because what interest me are the characters…I work a lot in theater and cutting-edge independent films, where I have many roles. [Most people probably] identify me as the villain from Matrix, but if I had to do that sort of character every time or play characters with no depth, that would not interest me. I like to play characters that are fully human, with all sorts of complexities and individual personalities, but I've been typecast playing the villain in Hollywood films. " David Mitchell's charming NY Times Magazine essay on the process of adapting his novel Cloud Atlas for the screen; also, a thoroughly charming interview from the New York Times Book Review. 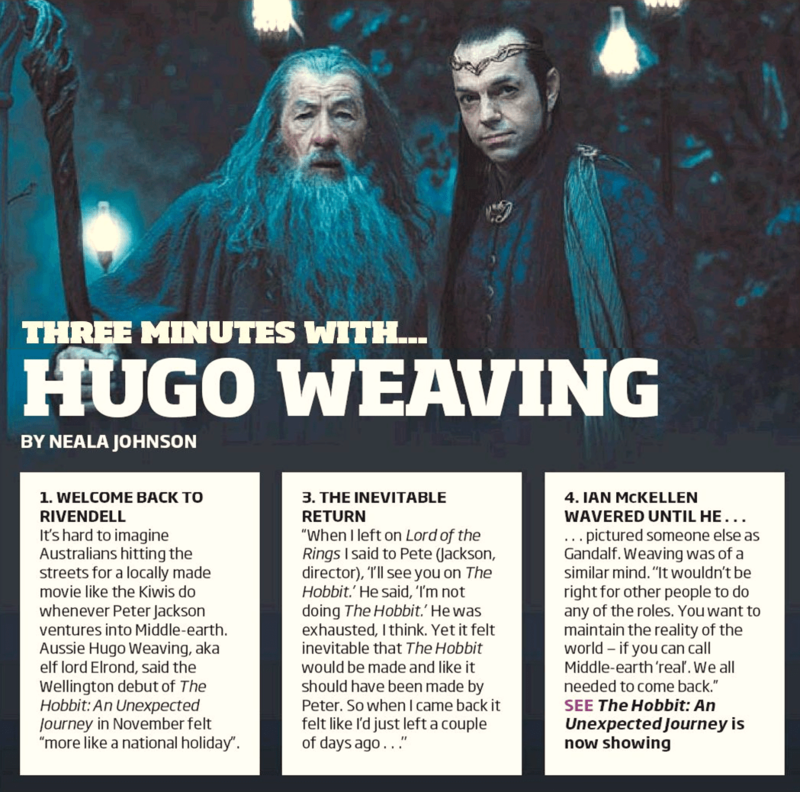 Entertainment Weekly's Fall Movie issue previews of The Hobbit and Cloud Atlas; also, their sneak peak of the first two film still from August and their positive (if slightly obnoxious and elitist review (Page One, Page Two.) And a brief interview with Halle Berry about her various guises in the film. Online Cloud Atlas Articles: Cloud Atlas Among Art Directors' Guild Nominees (HitFix), The Independent predicted (correctly, as it tuens out) that "[Cloud Atlas's] huge ambition is likely prove too much for Academy voters [but] ignoring it will undoubtedly leave a very large elephant in the room", Movieline debunks Mary Pols' idiocy (as have many others), Lubbock Online includes Cloud Atlas in its Best of 2012 list, Unsolicited Criticism notes Jim Broadbent's performances among 2012's best, Slate justly excoriates the Academy (and it's overwhelmingly old, risk-averse membership) for snubbing Cloud Atlas, Den of Geek chimes in eloquently on the same subject, Awards Daily names the "all boundaries are conventions" sequence in CA one of the year's best (and I agree– I never got through it in four screenings without weeping). Though CA was snubbed for most major American movie awards, it was nominated by The Gay and Lesbian Entertainment Critics Association’s (GALECA) for their Dorian Awards and for the German Film Awards (aka the "Lolas") in several categories. New Cloud Atlas Reviews: RubikunsReviews, The Society For Film, The Roosevelt News, Scene Contemporanee (Italian), Il Referendum (Italian), Cinemio (Italian), Seoul Sisters, Reel Drama Queen, Die Filmkritikerin (German), MyWorld (Italian), Spettacolo (Italian) and DiddlesMovies. New Hobbit: AUJ Reviews: The Examiner, The Film Connoisseur, The Highlander, Pop Culture Guy, Into The Sunset, and Filumreviews. And Alan Waldman included Oranges and Sunshine among his favorite 2012 films (despite the fact it opened in 2011 in most of the world)… proving great films are always new to someone, and that many need time to find their audiences. 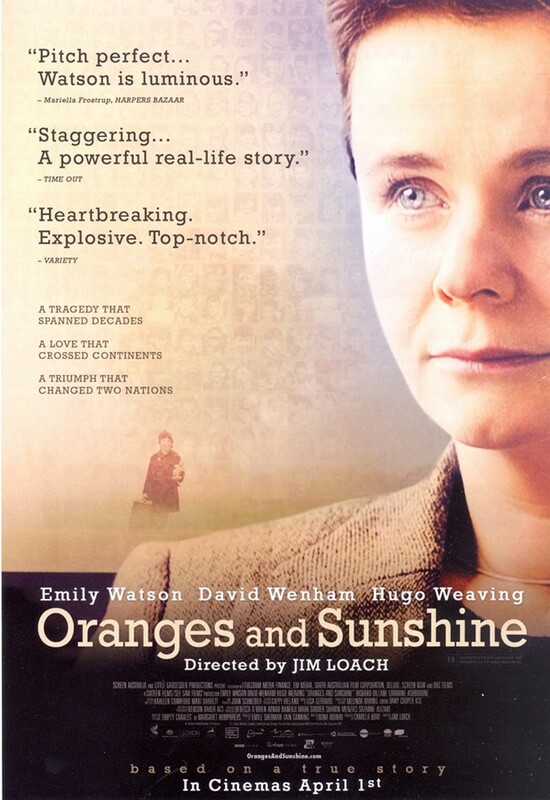 Oranges and Sunshine recently screened on BBC2 and is now featured on the US Starz/Encore cable channels. This "13 Minute TV Special" shared by ComingSoon.net on YouTube featured a combination of cast interviews and behind the scenes footage, including some that was new to me. And the previously-seen B-Roll videos (some of which Warner's has taken down at their original locations, rather inexplicably) are now available in HD versions, courtesy JimiBWatson. 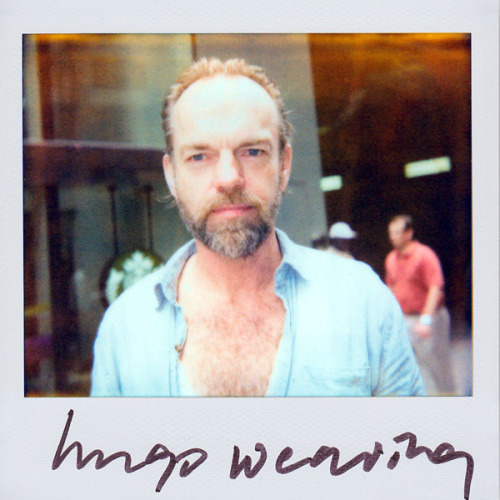 I'll re-post all five; Hugo Weaving is seen in #3 and #5. With Cloud Atlas due to debut in several more key markets early next month, there should be an uptick in news soon, though no official, additional premieres have been announced. (I think Hugo might be "premiered out" for the time being anyhow.) 😉 I'll also get back to work on adding additional vintage web articles (2005 onwards) to the digital Flickr archive as time permits. There’s been so much breaking news this week it’s been overwhelming trying to cover it all, but I’m working on it (whenever I can get breaks from my “real job”), so please be patient. Next comes word of a long-planned independent project Hugo had been planning with director Craig Monahan, who gave him a pair of his most provocative Australian roles in the films The Interview (1998) and Peaches (2005). 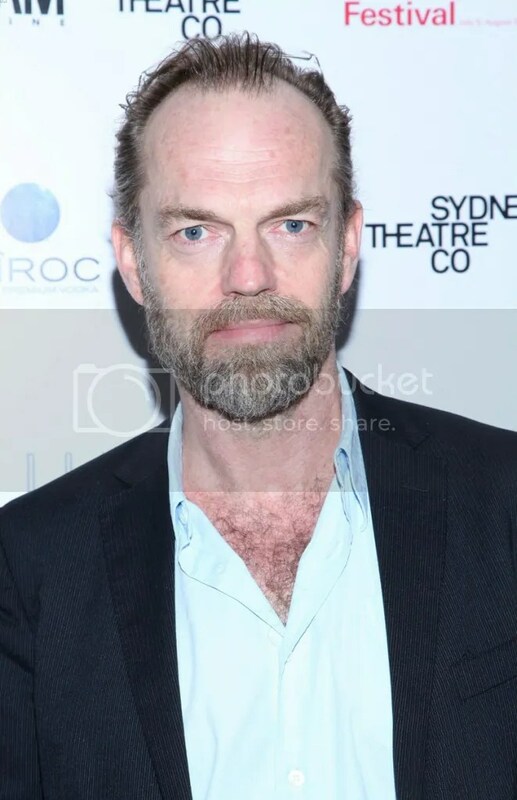 The film is a prison-set drama entitled Healing; according to Deadline’s report, “Hugo Weaving and Don Hany will star in Healing, an Australian drama about a sympathetic prison warden and his efforts to rehabilitate an Iranian-born prisoner, one of four features agency Screen Australia agreed to co-finance at its board meeting today….Healing will be directed by Craig Monahan, who co-scripted with Alison Nisselle. Los Angeles-based Lightning Entertainment is handling international sales and Pinnacle is the local distributor. Producer Tait Brady tells Deadline the film is based on a true story in which the rehabilitation of the long-term prisoner involved building an aviary in the low-security prison.” (Note: LJ refuses to save my entry with the Deadline.com hyperlink, so try these: Collider, The Hollywood News, HitFix. 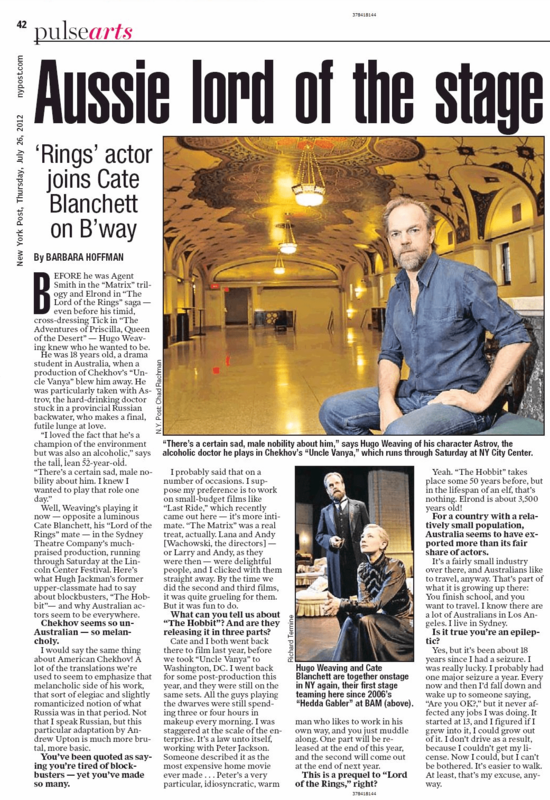 This has been a cherished project of Monahan’s for a long time; in 2005 (while promoting Peaches) he mentioned that his next film was in the scripting stage (Alison Nisselle is named) and might costar Weaving: “[It’s] a true story about redemption and hope. [Hugo] has expressed interest. 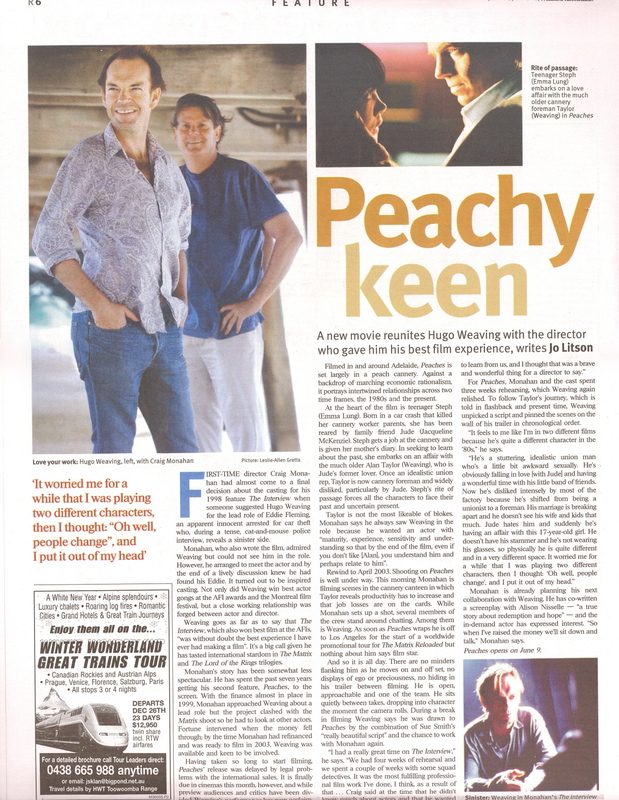 So when I’ve raised the money, we’ll sit down and talk.”) (The Weekend Australian, 4 June 2005) It took Monahan from 1998 to 2003 to finance Peaches, and another two years to get the film released, so it’s a testament to Monahan’s perseverance and Hugo’s loyalty that Healing (called The Healing in some early reports) will finally get made– no filming schedule or release date is yet known, but I don’t imagine Hugo will be available until next year. More to come, no doubt… this has been a very busy week. 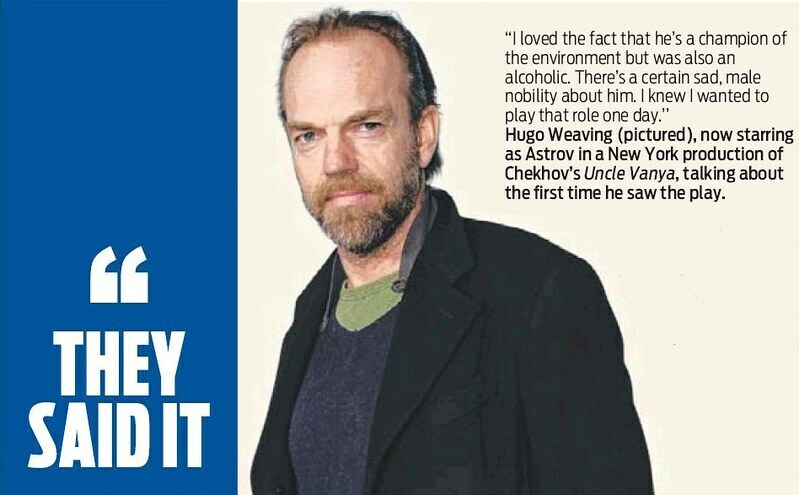 I’m happy to hear other fans have made it to Uncle Vanya. Sorry about all the technical difficulties in earlier versions of this post.